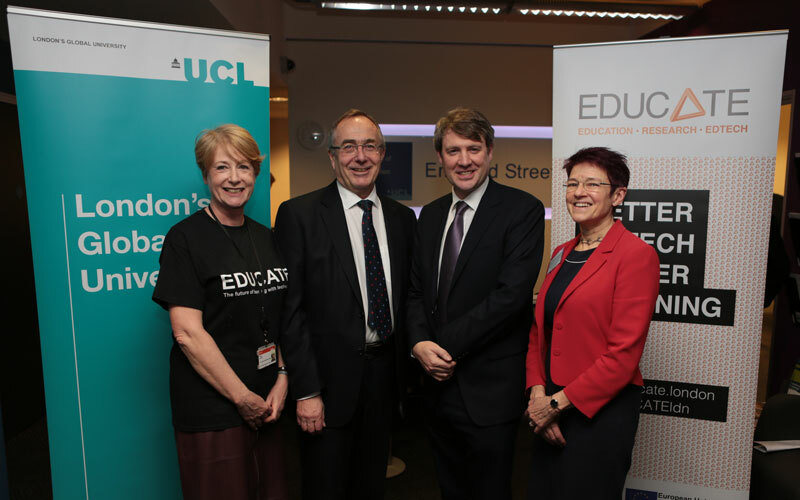 Universities and science minister Chris Skidmore today met with UCL Institute of Education (IOE) researchers and entrepreneurs who are involved in developing a number of start-ups which are creating world-class EdTech products and services to help children and adults learn. The projects are part of an IOE programme called EDUCATE, led by Professor Rose Luckin. Based in UCL Knowledge Lab, EDUCATE connects start-ups and business developers with leading experts in education and technology. It aims to use research-based evidence to develop 250 businesses which will help students and teachers and have a lasting impact in education. During the visit Mr Skidmore met with the founders of new companies including Little Bridge, Connect2Teach, Confident Beans and Interactive Scientific. With the support of UCL, these entrepreneurs are designing products which will help teachers and learners interact with digital platforms to help students work collaboratively, manage workload and build confidence and ability.